I spend so much time on the computer that posting can become a chore. But I am going to post some of the sketches I have done in the past month. Below is a late entry of McMenamins. I started the day with two notan sketches in black and white. These were really small sketches just to look for composition studying the patterns of light and dark. This is a sketch done after the Notan studies of a view I liked. It started raining while I was watercoloring. I finished the watercolor portion of the sketch from photos at home where I added the darsk. 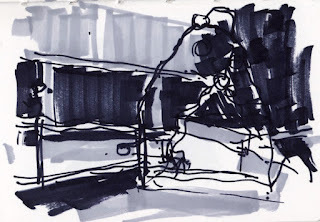 A quick 10 minute sketch in the Shed Bar where it was nice and cozy and warm. These sketches are all so different. Really shows a range of techniques, but they are all unmistakably yours-the vitality and line confidence come through no matter what. It is interesting that I don't see a signature style in my drawings but I think everyone has one.